Gryffin Sanders steered his great-grandmother's car into a ditch after she passed out while driving. Being the cowardly sort as a child, I can safely say that my personal reaction to being in the passenger's seat of an out-of-control car would involve a change of pants and a good dose of praying to whichever deity promised me a swift and splatter-less salvation. 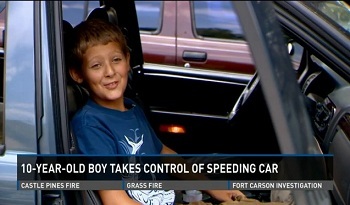 That being the case, I have to give credit to ten year-old Gryffin Sanders of Colorado who, after his great-grandmother passed out at the wheel, took control of the car and steered it safely out of oncoming traffic, saving his life, his grandmother's, and that of his younger brother who was also a passenger. Sanders, also being the sort to give credit where it's due, attributed his youthful driving skills to an unlikely source: Mario Kart. When questioned by reporters about his handling of the incident he told them he spends a lot of time playing the popular game. Granted, he also gave credit to his experience driving actual go-karts, but we're going to focus on the Mario Kart aspect of the story just because it gives us a bit of hope that our own virtual endeavors might someday amount to real world successes. What a joy it would be, for instance, if the countless hours I spent in the 90s trying to best my own score in Star Fox 64 had somehow equipped me to battle robot monkeys in the real world. Likewise, there's probably more than a few people who might enjoy the thought of their escapades in The Witcher 2 translating into tangible "romantic" skills. Even knowing these to be nothing more than silly fantasies, we still have to congratulate Gryffin on a job well done. He thought quickly in an emergency situation, saved the day, and did it all while rocking the name Gryffin.